Passed from us February 5, 2019, peacefully, surrounded by her loved ones, much-loved mother of Wendy and Nina, Granny to Jonathan, Jordan and Finn, mother-in-law to Ed. A Service of Loving Thanks will take place on Tuesday 12th February 12.15 p.m. at 54 Burnthill Crescent, Glengormley, BT36 5AE followed by a burial at Roselawn Cemetery at 2.00 p.m.
Marie will be resting at this address and visitors are welcome to call to pay respects prior to her final journey. Family flowers only please. 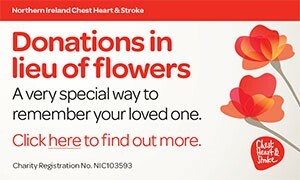 Donations, if desired, can be forwarded directly to Northern Ireland Chest, Heart and Stroke, 21 Dublin Road, Belfast BT2 7HB. Missed by many hearts brimming with memories, now at peace and reunited with John. From Jim and Jane McClelland and also Claire, Daniel and Mark. You were always there for us. I am sorry to tell you that Mary (Wee Marie) LOGAN has passed away.